Four of us ate at ZaZa on a Monday evening, July 27, 2009. It was a rainy day and the garden area was not open due to the rain. However, we wanted to sit outside, so they set up a table for us in the doorway of the restaurant's front room so we could be almost on the sidewalk. 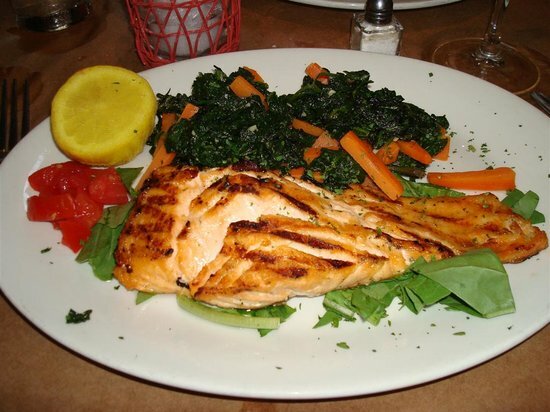 I ordered the salmon (see photo), which was delicious! I'm not overly adventurous, and somewhat cheap, so it took me a while to find something on the menu that I wanted to eat. I certainly was not disappointed. The restaurant was somewhat empty while we were there, so the service seemed a little slow, but just attentive enough. As far as atmosphere, we enjoyed watching the traffic and the people on the sidewalk from our perch in the entryway. It was definitely a quiet atmosphere in the restaurant, well suited for discussion and interaction with your dining party. Being from Indiana, I hadn't chosen the restaurant, but our NYC hosts had and I was overall very pleased with their selection. The total for my wife and myself with drinks and tip was about an even $100.